What Happens to Books Donated to the Library? to these schools, nonprofit agencies, businesses, and families.  Rochester Central Lutheran School, Rochester: about 600 books for school library.  Wit, Wisdom and Wine Gala: library books for silent auction at fundraiser. On Saturday, November 12, 2011, the Bookstore had $971.88 in sales. Why the big day? We had a 2nd Saturday Sale in the lobby, the focus being on unique, collectible and nostalgic books. Special thanks go out to Pat Stephenson for organizing and running the sale. 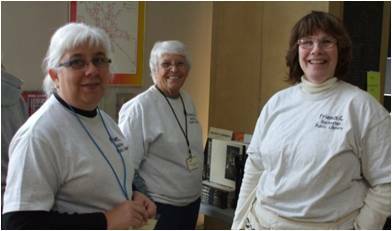 Thanks also go to Carol Smyrk, Dana Gilbertson, and Ruth Mangan who helped set-up and worked during the sale. And the sales couldn’t run smoothly without excellent cashiers at the register, so thanks to Mary Anderson and Phyllis Hodgson. The Bookstore is richer (pun intended) for the time you have spent volunteering! Dana Gilbertson, Carol Smyrk, and Pat Stephenson. difficult political situations was inspiring. Even though I knew how the book would turn out, I began to understand why he is the great man so beloved by so many. I listened to this one on CD, and after I was done, I missed Abraham Lincoln on my commute to work. The Hunger Games trilogy by Suzanne Colllins (The Hunger Games, Catching Fire, and Mockingjay) This is the story of a futuristic North America where 12 districts are ruled by “The Capitol”. The Capitol rules with an iron fist and maintains its power with an annual death match that pit two teens drawn by lottery from each of the districts in a fight to the death. All of the novels have strong characters and a compelling story. The Spellman Files by Lisa Lutz (Also The Revenge of the Spellmans, Curse of the Spellmans, and The Spellmans Strike Again) This is a laugh out loud series about a dysfunctional, but loveable, family of private investigators who spend more time investigating each other than doing business. The Harry Potter series by J. K. Rowling. I read this series to my daughter, and now I am reading it to my son. I can’t tell you how much I’ve enjoyed the books because it has been fun for all of us (even the second time around ). As I recently sat next to my daughter at the midnight premier of Deathly Hallows part 2, I was excited to share the experience with her. She reread Harry Potter and the Deathly Hallows in the week before the premier. We have these wonderful conversations that compare the books to the movies. At 3:00 am we stood in the kitchen and reread the last the last chapter together and discussed it. Anything that gets kids that excited about reading is fantastic in my eyes. This month of November, somewhere in Olmsted County, a child will receive the 300,000th book delivered through the United Way of Olmsted County partnership with the Dolly Parton Imagination Library. The link is to an ABC news article that provides many of the details. Remember books make wonderful holiday gifts for your children! And the deals in our Bookstore and at the Holiday Sale are amazing. Create a reader today! John Kruz and Heather Engh from Blue Moon Ballroom will be demonstrating the Salsa at the 11th annual Wit, Wisdom and Wine fundraising event on Saturday, January 14, 2012. John and Heather, dance instructors at the Blue Moon Ballroom, will introduce you to the exciting world of Salsa & Latin Dance. They will give a hot demonstration, a fun lesson, and explain the background and health benefits of Salsa & Latin Dance. Did you know that the average person can burn 420 calories in one hour dancing Salsa? Anyone can learn to “Salsa”, so join John and Heather to find out how you can have fun and stay fit at the same time. Tracy McCray will be presenting at the 11th annual Wit, Wisdom and Wine fundraising event on Saturday, January 14, 2012. After twenty years on the airwaves at KROC FM and AM along with the last few years as the Talk of the Town columnist for the Rochester Post Bulletin, Tracy McCray has just about heard it all. She’ll discuss the best and worst guest stories, the most memorable on-air gaffes (there are more than she’d like to remember!) and the most asked questions. PLUS you get to ask your own questions too. Lee Aase will be presenting at the 11th annual Wit, Wisdom and Wine fundraising event on Saturday, January 14, 2012. Lee Aase is director of the Mayo Clinic Center for Social Media, a first-of-its-kind social media center focused on health care, which builds on Mayo Clinic’s leadership among health care providers in adopting social media tools. Mayo Clinic has the most popular medical provider channel on YouTube and active, popular outposts on Twitter and Facebook. With its News Blog, podcast blog and Sharing Mayo Clinic, a blog that enables patients and employees to tell their Mayo Clinic stories, Mayo has been a pioneer in hospital blogging. By night, Lee is Chancellor of Social Media University, Global (SMUG), a free online higher education institution that provides practical, hands-on training in social media for lifelong learners. The 11th Annual Wit, Wisdom and Wine event will be held on Saturday, January 14, 2012. We have an amazing line-up of speakers and are rounding up some excellent silent auction items. Stay tuned for more details! Tim Penny will be presenting at the 11th annual Wit, Wisdom and Wine fundraising event on Saturday, January 14, 2012. Incumbent presidents have historically faced tough re-election odds in tough economic times. Will this pattern play out again in 2012? In 2008, then candidate Obama surged past John McCain, his campaign fueled by voter desire for “change” in the midst of a recession and the aftermath of a financial industry melt-down. Looking back over the past four years and ahead to November, how will Obama’s economic record influence this year’s election? More importantly, does either party have the formula for economic success? And, are voters prepared to support a candidate who tells some hard economic truths? As this year’s campaign unfolds, it is certain that both political parties will play the “blame game.” But come November, who will the voters blame? 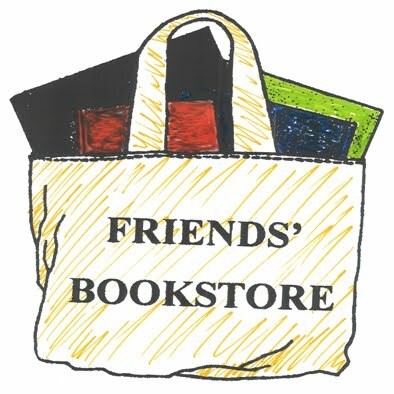 In the FRIENDS’ BOOKSTORE!!! AMAZING DEALS YOU WON’T WANT TO MISS! BEAT THE BLACK FRIDAY CROWD!! Thursday the 24th and Friday the 25th to celebrate THANKSGIVING! We will reopen normal hours on Saturday November 26th.